Throughout any hike of considerable length, most hikers look for accommodations with the services they need, but are priced below even the cheapest hotels. While hiking, I frequented several of these hostels and had experiences that were top notch, and experienced others that had the potential to make changes that would attract more business. It is important to note that these suggestions mainly apply to hostels where services are paid for, not donation-based hostels. Donation-based hostels are places where services are free, and the hostel asks for a donation for services. Please donate something to these establishments. Donation-based hostels are the ultimate trail magic and any funds to keep them operating is a donation to all future guests. This discussion is to develop a template of different areas guests look for and consider valuable in a hostel, to gather ideas about what hikers need to improve the experience, and to gain hostels more business by catering their establishment to what hikers seek. The first obstacle to getting to any hostel is actually arriving at the hostel. Hostels that are a short walk from the trail are ideal locations. This often makes up for other services the hostel may lack. If the hostel is not trail adjacent or on a road where hitching is easy, hostels normally offer a trailhead shuttle. Since hikers have chosen to stay at a hostel, I think any costs associated with this ride should be included into fees for overnight guests. No matter what, trailhead shuttles should be priced reasonably. Hikers flock to hostels when the weather turns south to seek refuge. The bare minimum a hostel normally has is a bunkhouse. If this is what a hostel chooses to have they should make sure each bunk has a clean comfortable mattress. Hikers don’t have issues using their quilt for warmth. Also, make sure hikers on the top bunk have a path to get up that’s safe without tipping the whole bed over. There is no feeling like trying to climb a bunk and the whole piece tipping. 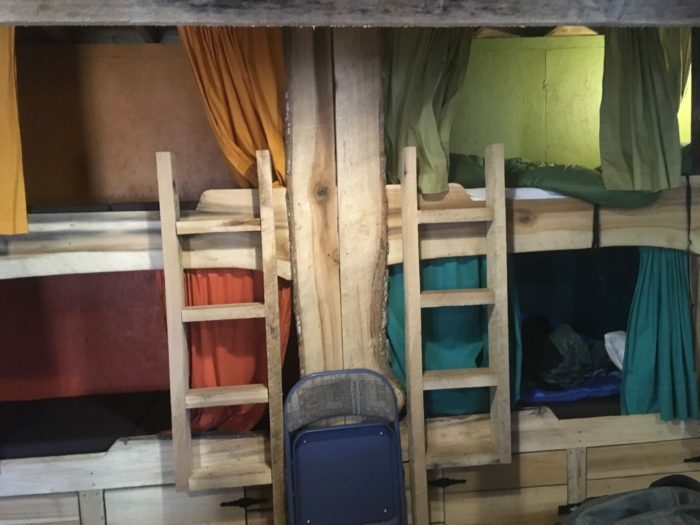 Often hostels choose to not do bunk beds and just use normal beds. Hikers appreciate this because bunk beds normally aren’t made for adults and beds are of superior comfort. 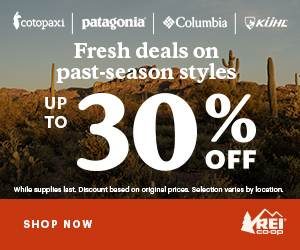 Hikers usually have a smell between body oder and cat pee when they arrive. In order to keep this smell from overtaking the hostel most hostels encourage and include showers. Rock n’ Sole even has an outdoor gas heated shower as an amenity. Showers should include towels. Hikers don’t carry a towel and drip-drying is not fun. Dogs make this look far to easy. Restrooms are a precious commodity around certain times. Multiple restrooms are a precious amenity that makes stays enjoyable. Clothes capture days of sweat and approach rotting due to lack of showers. 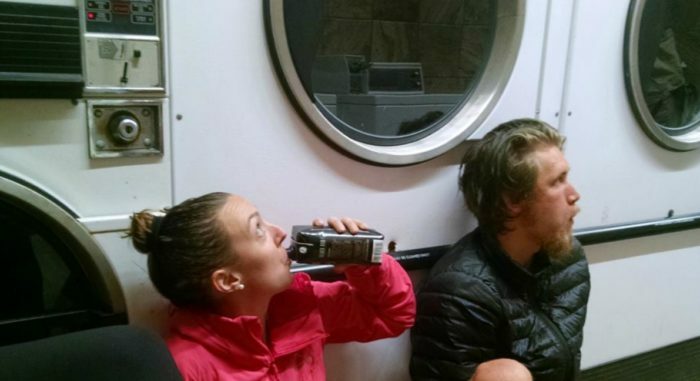 Laundry available at the hostel is excellent but a close second is a laundry mat in close proximity. Normally laundry is included with the stay but sometimes separated to reduce costs. Some hostels go a little bit overboard and charge laundry per person instead of per load. This takes advantage of hikers who only have two sets of clothes, which could combine with others to save energy and water. One interesting compromise that I experienced was free laundry if it was done together or laundry charge per load if it was done on an individual basis. Hikers love seeing hikers boxes in places other hikers have frequented. All it requires is a box where hikers can put items they may have extra. Hikers can sometimes get full days resupply from plentiful boxes. Boxes save hikers considerable money on a long trip and prevent waste. Wifi access helps hikers do everything from notifying their parents they are still alive to updating social media to tell others how great their trip is going. Also, several hostels have loaner computers and even printers. Computers help update blogs or answer email so they don’t have to type on tiny phone screens. Printers are useful for printing out park permits. Work-for-stay is an option lots of hikers look for when hostel shopping. Work for stay is an agreement where hikers get to stay for free in exchange for doing chores. For hikers running out of money on the trail work for stay combined with a hiker box can provide self-made trail magic. Hikers are seekers of cheap lodging options. If the weather is clear and the price is right hikers have no issues utilizing the tent they have to make camp in town. The area should be mowed with sufficient flat spots to set up tents or even sturdy trees for the growing number of hammockers. Uncle Johnny’s Hostel even built a covered area that allows tenting and hammockers to escape the elements in style. After days of summer heat hikers seek a cool refuge. Northern hostels on the AT are used for winter activities and don’t have AC or even fans in the room. If there is no AC at least provide fans for air circulation. 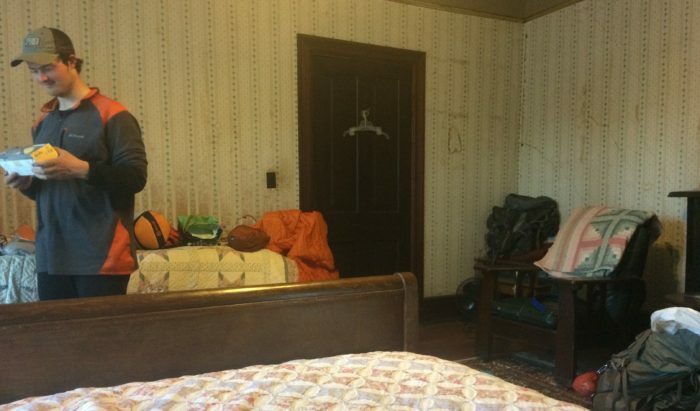 A hot room full of smelly hikers is the last place hikers want to occupy. Also be upfront if you don’t have AC in your hostel. Nothing like getting a ride to a “hostel” that’s just an outbuilding. To avoid having to get additional rides hikers search for hostels close to or with shuttles to resupply locations. Restaurants within walking distance also attract hikers. Hostels off the beaten path even offer shuttles to restaurants nearby. One of the best is Four Pines which shuttles to The Homeplace(AYCE). In every hostel there seems to be people camped around the bathroom waiting for their turn in line. Hostels may separate showers and toilets or have extra half baths for hikers and this is a nice amenity for hostels. Every hiker has ran into the morning rush when 15 plus hikers are all trying to take care of business with only one restroom. The Notch Hostel in New Hampshire excels at this by having restrooms on every floor(3). Room to spread all their stuff out and get a little privacy is just what hikers need to recharge their batteries. Sometimes these rooms are semi private which is still a better choice than bunkrooms and cheaper than hotels. Home-style meals even at extra cost were a favorite while hiking the AT. From Elmer’s masterpieces to the meals at the Rock N Sole in Pennsylvania home cooked meals are amazing to hikers who have been living on overly processed food. Terrapin Station and The Notch offered frozen pizzas, drinks and ice cream for sale onsite. These treats are nice if a hiker gets to the hostel late. Even in the absence of food available at the hostel full kitchen access can avoid dumping cash on town food. Nomadic hikers with random schedules use post offices from everything from getting food drops to getting replacement gear. Having one near or a shuttle to one is a helpful amenity. Other amenities that hikers appreciate are power strips to charge all their electronics, morning coffee for extra motivation to hit the trail, and canister/alcohol fuel for sales. Comment below with any items that should have made the list. Awesome and thoughtful post, Chris. I just stayed at Woods Hole Hostel in Pearisburg VA w my SOBO Thru Hiker daughter, Tinker Bell (Tink). They are close to AT so hiking in is easy. First night was in the bunk house and next night in a semi private room in main house. Neville & Michael, hostel owners, have put heart, soul and $$$ into this special place. They provide a choice of housing options so everyone can pretty much afford to overnight. They are also certified massage therapists. The shower/toilet house is amazing (2 large showers and 2 toilets) and services the bunkhouse and those choosing to tent. The bunkhouse has sleeping upstairs with couch, table and fridge and snacks available on main level. The beds hve fresh linens, pillow and a blanket. The home cooked dinner and breakfast are plentiful and delish and based on fresh veggies culled from their extensive gardens and fresh bread baked daily by Neville. Hikers pitch in setting tables and preparing meals as well as cleaning up. Staying in main house was so special: spacious room with shared hall bathroom. The atmosphere is very homespun … lots of interior and exterior areas to congregate … sweet pets (2 dogs & 5 cats) and farm animals (duck, goats, cows, pigs) who are also “pets”. Sunrises are gorgeous. After 1,566 miles, SOBO hikers totally appreciate Woods Hole. 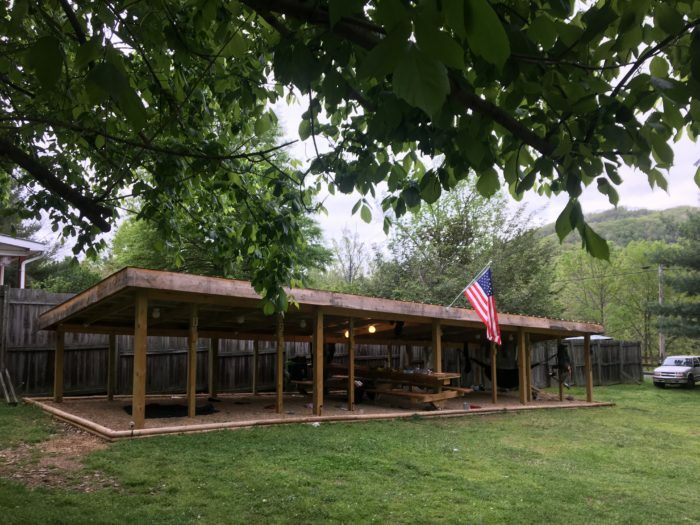 Many section hikers enjoy the Shenandoahs this time of year and make this hostel a destination as well. 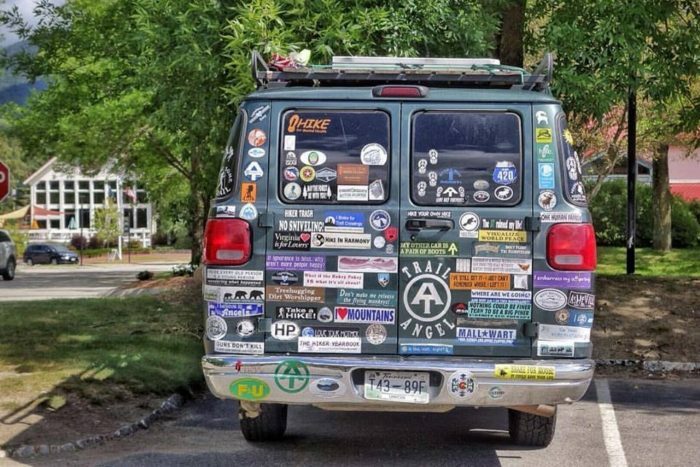 Hikers … put Woods Hole on your “Have to stay here list” and say hello for us! Greetings Kate! I remember Woods Hole very well. I visited for lunch one day and had several of their homemade treats and a milkshake. I wasn’t able to stay because I was busy trying to hike the saga that is VA for NOBOs. I agree it is an excellent hostel and I hope to be able to visit and spend the night if I am ever in their neck of the woods again! I cannot agree enough with the nicety of having access to a kitchen. As someone who loves to cook, especially for others, I often look forward to hostel stays with this amenity. I usually plan on cooking dinner for my fellow hikers at least once for every town stop! James, I never got a chance to cook for other hikers other than giving them frozen pizza I turned into a quitter with but I hiked with a guy named Mike who cooked breakfast for his whole group at every town stop. Having a nice breakfast to calorie up before you head out was amazing! Can anyone tell me how much the average hostel costs and when leaving a donation , how much is considered the right amount? Thanks in advance. AUSSIE GIRL. Greetings Aussie Girl. Thanks for reading and reaching out with questions. On the AT the average hostel was $25-35 USD/night for a bunk in the bunk room or $45-65/night for a private room. Donation based hostels usually provide a suggestion but if not in my experience a good donation is $10-$20/night. These prices are still below most of even the shadiest motels.